Freshman ride the “Merry-Go-Death” at the East Side Party last Sunday night. As the platform spins, riders stand near the edge and walk toward the center, causing the ride to spin faster. NEWS EDITOR; TUE., 5:28 P.M. The United States Department of Justice filed an appeal and an emergency motion this afternoon for a stay in Sherley v. Sibelius, the stem cell case under which an injunction issued last week Monday. That injunction prevents the NIH and other federal agencies from funding or considering to fund stem cell research, and has derailed many grants that were in the pipeline for consideration. 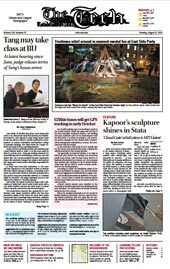 Last Friday, in the first step since Anna Tang’s trial came to an abrupt halt early this summer, the Middlesex Superior Court agreed to relax Tang’s house arrest so she can attend a class in “Mobile Application Development” at Boston University’s Metropolitan College on Monday evenings. The class covers the Google Android and Apple iPhone operating systems. What once was an empty lobby at the Vassar entrance of Stata — a large space, industrial white, washed with natural-light, but shrouded in concrete — is now filled with MIT’s newest addition to it’s public art collection. The new art piece, left untitled, is created by Anish Kapoor, a London-based artist who is most famous for his Chicago piece Cloud Gate (resembling a giant chrome kidney-bean). Filling the once-empty space his new oversized sculpture: a massive sheet of ultra-polish stainless steel, curved like a melted sheet of glass, diffracting light of the nearby skylight. Herds of tourists stop by each day, pausing in front of Kapoor’s piece to photograph their distorted reflections. MIT is still working to get GPS tracking to work on the EZRide Shuttle, which has taken over the job of the now-cancelled Northwest Shuttle. Live tracking and stop prediction will not be implemented until the first week of October according to Jeff Bennett, the project manager for the Charles River Transportation Management Association (CRTMA), the company that runs the EZRide. During its decades of rapid growth, China thrived by allowing once-suppressed private entrepreneurs to prosper, often at the expense of the old, inefficient state sector of the economy.